It was a landmark judgment by the Supreme Court. The queer case of the ‘gay cake’ has been rumbling on for four long years, and the highest court in the land has finally decreed that Christians may not be coerced to propagate a political or religious message which offends against their conscience: illegal discrimination does not extend to compelled speech. In their place of business, Ashers Bakery, the McArthur family had rights to free expression and freedom of conscience not to express a view with which they did not agree. A five-judge panel of Lady Hale, Lord Mance, Lord Kerr, Lord Hodge and Lady Black made the decision, and it was unanimous. That is significant: there was no conservative-liberal split; no ‘swing vote’ making it a product of partisan deliberation. It was consistent and undisputed. In the increasingly-convoluted competing hierarchy of rights, this was an undoubted win for freedom of religion. There is a blindingly obvious distinction between refusing to bake a cake conveying a particular message for a customer who wants such a cake, and refusing to bake a cake for a particular customer who wants it because the customer happens to be gay. The ‘gay cake’ would not have been baked if the Asher’s customer had been straight, pansexual or completely asexual: the customer’s sexuality was completely irrelevant (indeed, it may not even have been known: there is no ‘Test Act’ for Ashers Bakery customers). Indeed, Daniel McArthur would have refused to bake such a cake for a fellow Protestant Christian, if such had been requested. This was simply not discrimination on the grounds of anyone’s protected characteristics. And yet that isn’t how the Northern Ireland Equality Commission saw it. And it isn’t how the Belfast County Court saw it. And it isn’t how the Northern Ireland Court of Appeal saw it. Clearly, the queer case of the ‘gay cake’ isn’t such a blindingly obvious distinction at all. Even after the judgment of the Supreme Court there are murmurs of discontent: this judgment may yet be revisited. No Church of England bishops have ever expressed any support for the McArthur family. None has ever tweeted support for the Christian Institute as they threw £200,000 at the case in order to clarify the law and secure freedom of religion (and conscience, and expression) for us all. Today’s CofE ‘Daily Digest’ doesn’t even mention the judgment. It covers World Mental Health Day; Gordon Brown on Universal Credit; the Evening Standard‘s influential Londoners including Bishop Sarah Mullally; Rachel Treweek at the Cheltenham Literature Festival; the retirement of the Bishop of Dover; the Archbishop of Canterbury’s Just Finance Foundation; a few arts pieces, and the wedding tomorrow of Princess Eugenie and Jack Brooksbank at St George’s Chapel in Windsor. There is not one word about the Supreme Court judgment in the queer case of the gay cake: not one member of the House of Bishops (or even the College of Bishops) has tweeted a single word about its significance, which will be far-reaching. We have been saved from equality tyranny: the Supreme Court decisively protected and strengthened freedom of religion yesterday, and that is good news for people of all faiths and none. This blogpost isn’t part of the ‘continual campaign against the bishops‘ (honest): it is simply a question. Why has the queer case of the gay cake not attracted a word of support from CofE bishops for the McArthur family, who have endured much suffering, worry and heartache for four long years? Why has all the forthright advocacy been left to the Christian Institute and its sterling leaders Colin Hart and Simon Calvert? Why have they had to foot all the costs? Why haven’t the Bishops been leading calls for justice and freedom in this case? 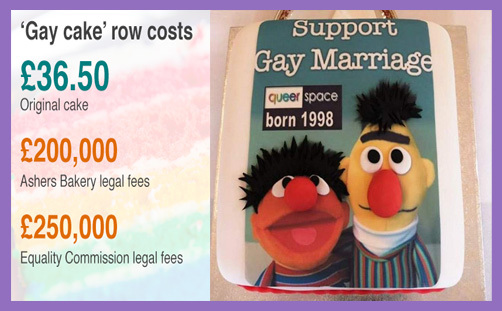 It isn’t because Gareth Lee, who ordered the cake, is a gay rights activist, is it? It isn’t because the Bishops don’t want to be seen as prejudiced against him, is it? It isn’t because they actually disagree with the Supreme Court and side with the NI Equality Commission, is it? It isn’t because they think Daniel McArthur is a homophobic Protestant bigot, is it? It isn’t because they believe that equality trumps freedom of religion, is it? Perhaps one of them – just one – might let us know?